Eclipse Group brings together a world of specialized services and support. Eclipse Group is a U.S. company based in Maryland, with offices and strategic partners in the United States, United Kingdom, Cyprus and Singapore. Our global reach supports our diversified customer base of international and U.S businesses and government agencies. To assist us in bridging cultural gaps, our global team employ staff that are fluent in Arabic, English, German, French, Italian, Spanish and Greek, making us a truly multi-cultural organization. EDT is a supplier of high specification offshore support vessels to the oil and gas industry worldwide. Our vessels also support survey, diving and ROV operations and have assisted in military and civilian aircraft wreckage recoveries. CABACO Marine Pte Ltd, established in 1989, began as a marine service company and developed into a project-oriented offshore service company. The Guice Offshore team is very well versed in the marine transportation sector, possessing a working history in both commercial shipbuilding and in vessel management. Hull and structural welding; propulsion systems; propellers, deck machinery; electrical and hydraulic system installation and repair; carpentry/joinery work; piping; inside and outside machine shop; sand blasting and painting. 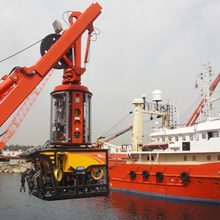 SMD provides proven subsea trenching, burial, tooling and work-class remote operated vehicles solutions to both commercial and government customers worldwide.